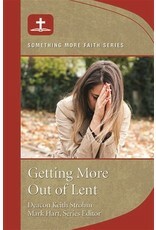 For many of us, Lent can be a challenging time. We endure the pain of fasting, the struggle to give up comforts, and the hope to get through without too many slipups. But it doesn’t have to be that way. Getting More out of Lent will guide readers to experience the wonderful gifts of the season of Lent, and help us come to know Jesus in more personal way. This 40-page booklet is designed to maximize individuals or small groups time while providing a deep impact on one's spiritual life. Written for both individuals and small group use, this guide will offer insight, Scripture, and prayer, and lead participants to a closer relationship with God in a way that is accessible, engaging, and meaningful to daily life.